Music is indeed one of the most entertaining careers but unlike any other group. Musicians are often at a higher risk of developing noise-induced hearing loss over time, due to the constant exposure to loud music and events. This can easily be avoided by wearing a good pair of earplugs when attending or performing live at concerts and other gigs. Not only will they filter out harmful frequencies that may cause tinnitus and hearing loss, but will also keep the audio clear. They will not compromise your ability to properly perform your music (Source). With that said, there are many different types of earplugs and not all are effective. It’s important to make sure that you invest in a good pair, one that’s discrete yet fits your ears snugly and comfortably. Also, look for a pair that lowers the volume low enough while still offering great sound quality. In an effort to help you narrow down the list, we’ve rounded up the five top rated earplugs for musicians that are worth investing into, and can seriously help reduce the risk of losing your hearing. 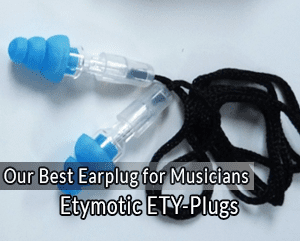 Etymotic is a very reputable audio company known for producing some of the top quality ear plugs. Their ETY-Plugs model is no exception. These are the best earplugs on our list. They strike a good balance between sound quality and protection. First off they are very comfortable and fit nicely into the ear canal thanks to their ergonomic design and the slightly textured silicone flanges which facilitate smoother insertion. They are relatively discreet and the little tag on the stem makes it easy to remove them. The earplugs are designed to function just like the ear canal. They utilize an acoustic resistor and a proprietary tuned resonator to imitate the natural response of the ear. The sound quality is reproduced unchanged. It’s clear, natural and quieter. The music sounds more like it’s turned down just enough, not muffled. The earplugs reduce all sound evenly by up to 20dB which is pretty good for a concert performance or a band rehearsal.While most standard foam earplugs will reduce high and mid-range frequencies, the Etymotic ETY-Plugs provide a good balance between high, mid and low frequencies. It produces a flat sound response, thereby preserving the richness of music and clarity of speech and communication. In general, whether you are performing to an audience or attending a concert, these Etymotic earplugs will effectively protect your hearing and still maintain the full spectrum of sound. They come with wonderful accessories which include a neck cord, carry case and interchangeable tips. In the second position, we have the Eargasm High Fidelity plugs and one of the main things that makes these plugs stand out is their ability to provide very high sound clarity. Whether you are in a medium or extremely loud environment, the audio quality on these plugs is impressive throughout. Made from a soft hypoallergenic silicone, these Eargasms plugs are comfortable enough for wearing all day long. The silicone is non-toxic and as such will not cause irritation due to prolonged wear. In addition, the plugs have a three-flange design which can comfortably fit almost any adult ear and they come with two different sized earplug shells. So, unless you have a very small ear canal, you will have no problem wearing them. They will hardly get noticed when wearing them because the clear color of the silicone provides a low profile that makes them nearly imperceptible. Removing them is also very easy. The interior is anti-stick and there’s a built-in pull tab. It only takes a slight twist and a little pull, and they slide out easily. Why We Love The Eargasm EarplugsWhen it comes to hearing protection, these plugs can provide up to 21 dB drop in decibels. So they will significantly cut out harmful noise at loud events hence minimizing the risk of developing hearing loss. The best part about these Eargasm plugs is that while they do block harmful noise, they don’t compromise the quality of sound at all. They reduce the noise evenly hence reproducing sounds exactly as you would hear them with your bare ear but at a safer volume. You will get to hear every sound frequencies with these plugs. To sum it all, the Eargasm High Fidelity Earplugs is an ideal choice for someone looking for high sound clarity along with protection against hearing loss. Furthermore, they come with a compact aluminum case that you can be easily attached on your keychain and has a waterproof rubber seal to protect the plugs from moisture, dust as well as debris. The LiveMus!ic Hearsafe Earplugs are designed to provide superior quality. Like the ETY-Plugs from Etymotic, this too is a very well balanced pair of earplugs you can find on the market. The package consists of two sets of earplugs hence provides a great variety of usage. Both sets are very comfortable and you can wear them for many hours without feeling irritated. They are made out of a soft hypoallergenic silicone material that nestles gently on the ear. The plugs can perfectly fit almost any ear size. The low-profile tripe flange design combined with the conical shape facilitate a more secure and snug fit inside the ear canal. 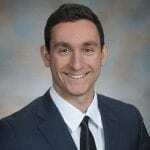 So, they are less likely to come off or cause soreness when you are busy performing or practicing. Aside from their ergonomic design, these LiveMus!c earplugs offer some outstanding protection. Rather than utilizing interchangeable filter system, each contains a precision filter with different levels of attenuation. They both reduce noise by a great deal. The green filter offers a Noise Reduction Rating of 23dB and can effectively reduce background noise as well as medium-range noise frequencies hence delivering clear sound quality at a safe volume. The white filter on other hand offers a whopping 29 dB of noise reduction. So, it will effectively reduce and weaken high-frequency noises which makes them ideal for use in extremely loud environments.Even more, you will be able to hear the highs, mids, and lows while wearing either set in different noise environments. They both have a relatively flat response, thereby preserve the sound clarity and sharpness. You will not struggle to carry a conversation when you’ve put them on. One issue you are likely to have with these earplugs is that although they provide a comfortable fit, they are not the easiest to remove. The stems are too short and as such, they are a bit hard to hold. If you don’t have a strong grasp, you may be forced to use tweezers or some other device in order to pull them out. All in all, these are definitely the most versatile sets of earplugs you can invest in. The variety in the noise reductions ratings gives you the freedom to select the level of protection you want. If you often perform at different venues with different acoustics and sound systems, then you should consider getting these LiveMus!c Hearsafe Earplugs. 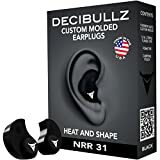 Decibullz is a relatively new brand in the ear protection market but even so, they have a good number of quality earplugs and headphones under their name. The DeciBullz Custom-Molded Earplugs is one of their top performers and offers the highest NRR on our list. The first thing to like about this pair of plugs is that you customize it to exactly fit the shape of your ear. 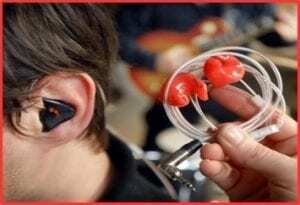 They come with two thermoplastic molds that can be boiled and stuck inside the ear once it cools and shaped according to your particular ear canal. The molds are re-formable, so if you didn’t get a perfect fit you can always repeat the process. These are the only earplugs that are moldable and it’s a big plus because when done right, you get a lasting custom fit. Aside from the custom molds, the plugs feature three pairs of triple flange tips with varying sizes and a set of medium foam tips. So, they will fit almost any ear. However, the major highlight of these Decibullz’s earplugs is their superior noise reduction capability. They have an NRR of 31dB which is more than adequate for almost all kinds of situations even the loudest of venues. The plugs use filter inserts which not only muffles loud sounds to a comfortable level but also allows the wearer to clearly hear quiet sounds, such as conversations. The sound quality is not the best but it’s fairly good. This is the only major setback with these plugs, but if it is sheer noise reduction power you are looking for, then they are the best choice. 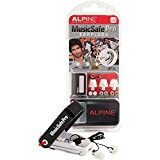 Closing our list is the Alpine MusicSafe Pro, another good pair of earplugs from a very reputable brand. These Alpine plugs provide both sufficient noise protection and good sound quality. They are compact and very comfortable. These earplugs are made out of a soft, flexible Thermo Shape material which collapses inwards to conform to the shape of your ear canal. They provide a soft and snug fit which makes them comfortable to wear for long hours. Included in the package is a special insertion device to help you when fitting them into your ear canal and removing them after use. Now the thing that sets apart this Alpine plugs from the rest is that it can provide optimal protection against different harmful noise levels. They come with three interchangeable filters for low, medium and high-frequency noise attenuation. The heaviest filter can attenuate up to 27 dB of volume. So, you can choose the filter that suits you depending on the level of noise around you. The sound quality is not that distorted along the way. You can hear pretty much everything clearer with these plugs. They retain the sound quality just not as good as the other four plugs above. Considering that they fit inside your ear canal snugly, removing them will also be a little more cumbersome without the insertion device. So, you will have to always carry the insertion device every time you are using the earplugs. Overall, the Alpine MusicSafe Pro is a great pair of earplugs. They fit snugly into your ear and the three filters with different attenuation levels allow you to pick the protection level that’s ideal for you. They are the best option if you have occasion gigs that have different sound levels. First and foremost, you want earplugs that are comfortable and fit properly inside your ear canal like they have been specifically designed just for you. The last thing you would want is your earplugs falling out or causing irritation when you are on stage performing or in a concert. Here, the best options are either earplugs that are custom moldable like the DeciBullz’s plugs above, or plugs with a flanged design made out of a soft silicone material. The latter is much better because most of the silicone material used to make plugs are hypoallergenic and nontoxic. So, they can be used for hours without causing irritation or discomfort. Aside from comfort and fit, you should also ensure that the plugs can come out easily. The stem should be a bit long but not too visible so as to facilitate a firm grasp and make pulling out the plugs easy and safe. Always go for plugs that are soft and comfortable, and provide a custom fit. This way you will get to perform or enjoy quality sound for hours on end and don’t have to worry about them falling out or causing soreness after the event. As a musician, you want earplugs that you can wear around any loud event or environment. A great pair of plugs that will keep loud sounds to safe levels so as to protect your hearing. The effectiveness of an earplug here will be determined by its Noise Reduction Rating (NRR). The higher the ratings the more noise attenuation the plugs will provide. In this case, you should mostly consider plugs that offer an NRR of 15 to 35 dB as they will offer better protection against medium to high-frequency noise. The safe sound range for human ears is 85 dB and below. Anything above that has the potential to cause noise-induced hearing loss. So, make sure to get a plug that has a higher noise attenuation rating to ensure sufficient protection from harmful noise. 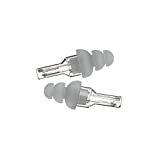 A great pair of earplugs for musicians is one that’s able to decrease the noise without compromising the sound quality. Most standard earplugs block out so much sound such that they can lower the quality of the music. They often sound flat and muffled. However, most music earplugs have precision filters which block out the loud noise and lets in the precise tonal quality. So, if you want to enjoy the finer nuances in the music while your ear is still protected, you will have to consider getting high fidelity earplugs. These sets are designed to attenuate sound evenly across the frequency spectrum. This means that the reproduced sound will be clear, sharp and as natural as the original but much safer. To sum it all up, the best earplugs for musicians is one that can provide great sound balance, as well as volume balance in all frequencies or noise levels. This, of course, cannot be achieved if the plugs don’t fit. Thereby, it should also be able to fit snugly inside your ear and comfortable enough to wear for many hours. There is a wide variety of earplugs for musicians out there to choose from depending on your personal preference on style and how loud your gigs are. However, our top five list covers the best models you will find in the market which very much worth considering first.If you usually perform in moderately loud venues and want high sound clarity, then you should take a closer look at the LiveMus!c, Eargasm and Etymotic earplugs listed above. If your venues are often louder, then you might want to go with either the Decibullz or Alpine earplugs. However, if none of them is the best fit for you, then you should be able to get quality earplugs that meet your needs.